Finally decided to jump off my high horse and made a recipe from scratch. 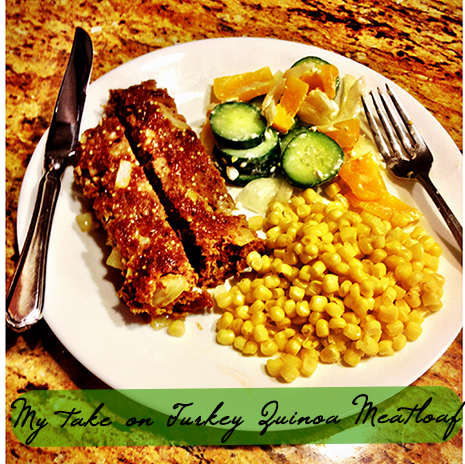 This turkey quinoa meatloaf sounded like exactly the dish I needed to break my usual routine and something I would definitely love. And let me tell you, it turned out DELICIOUS. Below is the recipe I used from AllRecipes.com. Heads up: It does require about 50 minutes to bake but it is really not that difficult to make. Sides I included with it: Corn & Cucumber, Yellow Peppers, Goat Cheese and Onion Salad. Overall, this ingredients were super healthy (quinoa is a the new super food!) and really filling. It turned out pretty moist too! I’m definitely going to have to give it a try! It is so low cal and it is one of those things that people who arent trying to eat healthy would probably enjoy as well! Thanks girl! 🙂 super yummy!